Well….I don’t consent. No way am I going to dismiss the dreadful suicide rates documented by the CDC. It’s a shame and a stain on my church. The LGBT policies of the LDS church are, at best, purely temporary. A modern apostle taught us this fact. You can find his words detailed HERE. These policies are not binding on the church until they are presented for a vote and sustained by the majority. This is a restored principle of the restored church. The prophet Joseph F. Smith testified before the U.S. Congress that this is the way the church functions. His testimony is recorded HERE. It’s not the gay kids that need to change. It’s the policies, teachings and attitudes of the institution that need to change. They aren’t even real policies. Only temporary!!! Gay kids need sympathetic support. Not suicidal support. At April’s General Conference, I will exercise my right, privilege and responsibility to vote opposed. If it saves one LBGT youth from suicide…the shunning & temple recommend loss that I endure, will all be well worth it. Over 45 years ago, I witnessed the beating of a poor innocent mentally challenged kid. Essentially, I consented to his beating by standing on the sidelines and uttering no protest. I have deep, deep regrets, which are recoreded HERE. I’m not going to make another dreadful blunder by standing on the sidelines as suicides soar. To read a fuller analysis of Utah’s teen suicides and their link to the church’s LGBT policies, this is a great SITE. The author put together the graph above from data provided by the CDC website. Fortunately, I’m not alone. There are now 322 of us living the law of common consent and voting opposed. 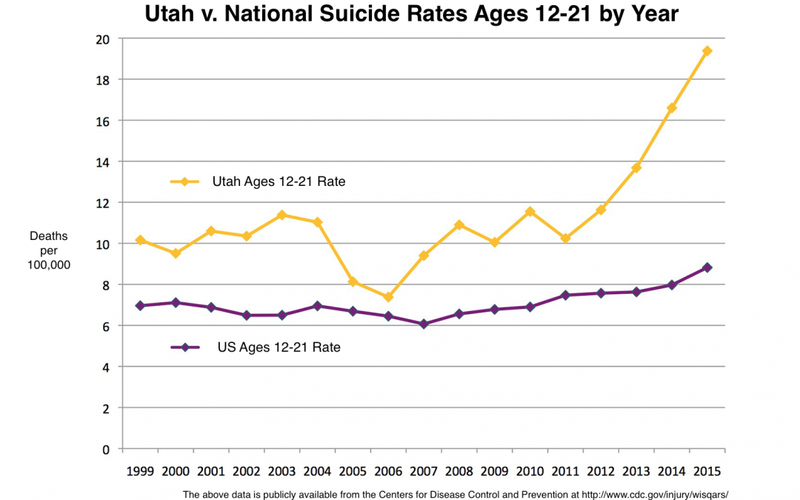 Shocking stats on Utah suicides! The reality of The Brethren vs LGBT is beyond horrifying. Have you considered the possibility that some of The Brethren might actually APPROVE of what is shown on the graph? I’m coming to Houston (HOU) on March 29 enroute to Katy for a Thu-Fri-Sat seminar. I need a ride from HOU to Katy and wondered if you are available? I could buy your fuel and we could meet? My flight arrives 6:55pm. Otherwise, I am available later Saturday night, all day Sunday, and flying back to PDX Monday at 1:50pm. I would love some face time with you, Sam. Can we make that happen? I think you can access my email. A visit to Houston? What fantastic news! The weekend doesn’t work, as I plan to be in Utah to cast my Suicide Vote. So, March 29 would have to be the day. Let’s tentatively plan on that. Of course, I’ll need to confirm with the boss of my household. All I can say is….COOL! Let’s plan on March 29 face time! It will be a treat to meet you in person! Kudos 2U for showing up at GenCon to defend our LGBT brothers and sisters from the WWJND behavior of The Brethren (what would Jesus NEVER do). What ever happened to “Verily I say unto you, Inasmuch as ye have done it unto one of the least of these my brethren, ye have done it unto me.” ??? Let’s see if your General Manager clears you for March 29. And, btw, there’s a high probability that I will return to Houston again on April 25 – May 1 for the graduate seminar in Katy. Sam, where did this graphic come from? Its source is referenced in the body of the blog. Obviously, I didn’t make it clear. Here is the link to the article. The author gathered his information from the CDC website. Got challenged? How did your conversation end up?